Whether you’re looking to impress clients with a Monaco Grand Prix event or using the yacht as an function venue for a trade show or conference, corporate yacht charters are the ideal way to maximise the visibility (and memorability) of your brand. Imagine your VIP clients mingling on the sundeck in Monaco, drinking champagne and eating canapés as the F1 cars roar past, or dressing up for a themed yacht party during the Cannes Film Festival. Yacht parties are an extraordinary branding opportunity. Done right, your brand is the one people will be talking about at the end of the event, due to the incredible yacht party you hosted in extraordinary surrounds. It’s really important to choose the right luxury yacht for your specific corporate needs. That’s where your yacht charter management company comes in. For instance, if you’re planning a glittering yacht party to showcase your corporate brand, you’ll want a yacht with large deck area and a glamorous interior, as well as state of the art entertainment systems and impressive features like a deck Jacuzzi. The effectiveness of yacht parties as a branding exercise depends very much on making a spectacular impression. If you have high numbers of guests, you’ll need to talk with your charter yacht broker about passenger licences and accommodation on board. Charter yacht management companies are also on hand to assist in the organisation of your corporate yacht charter, from yacht branding to catering and entertainment for yacht parties. Those chartering a yacht during a conference such as MIPIM or TFWA will probably want to have a ‘static’ yacht charter whereby the yacht doesn’t move from the dock. Such a charter enables you to festoon the yacht in your company branding and invite large numbers of guests onboard for yacht parties. The berth you choose will also directly impact your visibility and success during the event, so talk to your broker early to secure a high-impact berth. Alternatively, if you really want to wow a select group of clients, you can plan a spectacular cruising itinerary. Here, factors such aswatertoys, alfresco dining, and yacht Jacuzzis become particularly attractive. The logistics of a corporate yacht charter can be daunting if you’re trying to do it all on your own, but it’s made extremely easy by choosing a reputable charter yacht management company. 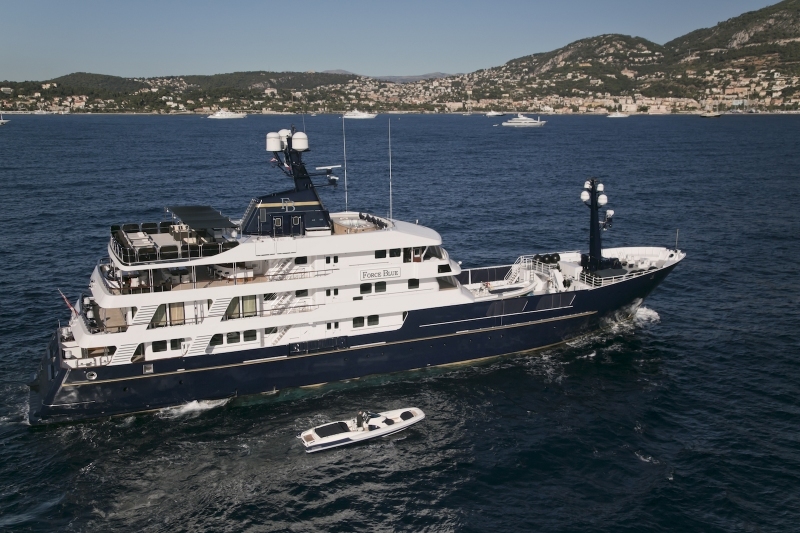 The spectacular 63.3m M/Y FORCE BLUE is one of the finest corporate charter yachts afloat. A commercial vessel transformed into a striking superyacht, M/Y FORCE BLUE offers stunning entertainment capacity for yacht parties, including a disco room, cinema, and even a spa centre! With vast deck spaces over four levels and palatial interior areas including a boardroom-style dining room for meetings, M/Y FORCE BLUE is the ideal venue for yacht parties and corporate yacht charters. Elevator access makes the yacht ideal for guests with reduced mobility, while the huge Jacuzzi pool on the sundeck provides a focal point for parties and a great place to relax after the night before. M/Y FORCE BLUE has six staterooms for 12 guests, and runs with 21 professional crew to ensure your corporate yacht charter or party is superbly staffed, catered, and managed. 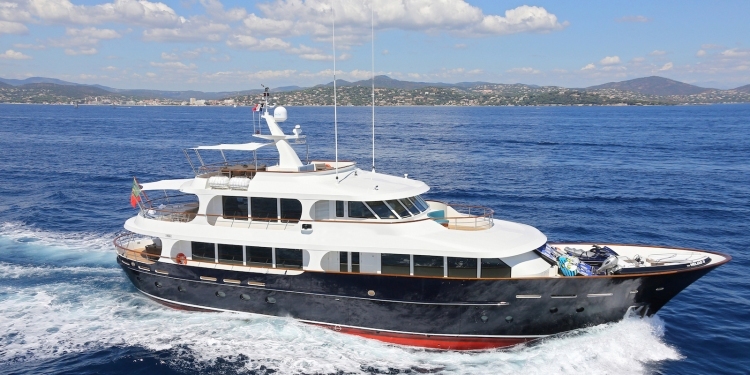 M/Y FORCE BLUE charters out in the Western Mediterranean from €235,000 per week. M/Y SIMA has fantastic features for corporate yacht charters and parties, including large deck spaces and a deck Jacuzzi. Private meetings can be held in the master suite office, company presentations can be made in the salon with drop-down plasma screen, and client lunches and dinners can be hosted either outside on deck or in the yacht’s elegant wood-panelled dining room. As a tri-deck yacht, yacht parties onboard the 39.6m M/Y SIMA can spill over three decks, and onto marquees on the dock for static yacht charters. The spacious sundeck will be the focus of yacht parties with its Jacuzzi and bar. Accommodating up to 10 guests in five generous staterooms, M/Y SIMA charters out in the Western Mediterranean from €100,000 per week. Dutch-built M/Y ROBBIE BOBBY is all class. Launched in 2013, this 33.5m luxury motoryacht for charter has the classic lines of a gentleman’s yacht of yesteryear, combined with a gorgeous contemporary interior. 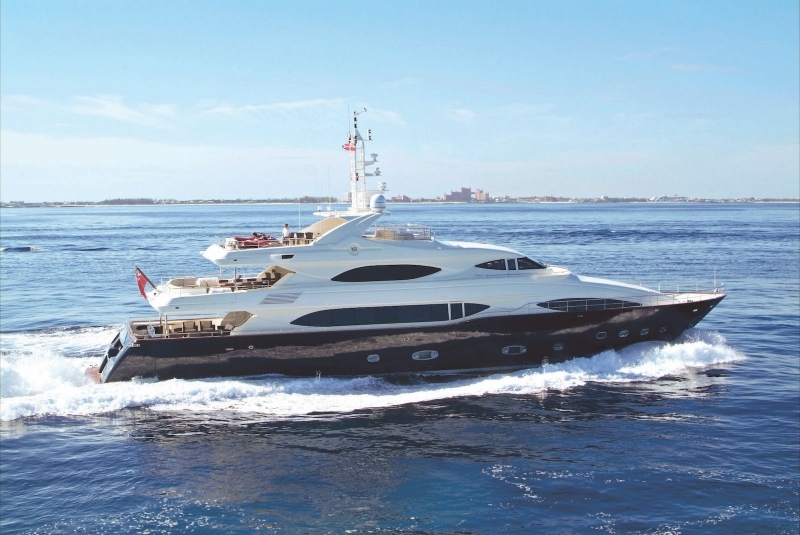 Her huge volume makes this a great party yacht, with a spacious interior and impressive alfresco entertaining areas. M/Y ROBBIE BOBBY also features a fantastic drop-down swim platform in the side of the hull, perfect for launching off on the yacht’s many watertoys or for your party guests to arrive by tender for an exclusive yacht party at anchor. Accommodating up to 12 guests in five stylish and airy staterooms, M/Y ROBBIE BOBBY has the perfect set up for a corporate yacht charter whether static or cruising, and is available for Western Mediterranean yacht charters from €95,000 per week. These three yachts have hosted some extraordinary yacht parties and corporate events for companies looking to make an impact. Will your brand be next?